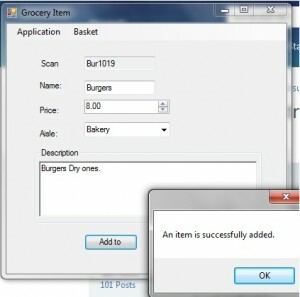 to allow users to add grocery items to the shopping basket. will be used in the next graded project. 2. Add a new form to the project named GroceryItemForm. RichTextBox control and a Button control. 5. Add the option E&xit to the Application menu. 6. Add the options A&dd and &View in the Basket menu. 7. 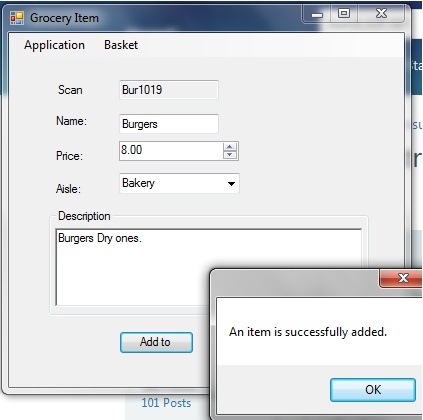 Save your work on GroceryItemForm.vb. 8. Open the design view of LoginForm.vb. 10. Select txtPassword. Set the PasswordChar property to *. txtPassword controls to 0 and 1, respectively. 12. Save these changes on LoginForm.vb. 13. Open the design view of GroceryItemForm.vb. 14. In the form’s Load event, display the login form modally. variable is the GroceryBasket collection. e. Add the GroceryItem object to the basket variable. f. Make sure to clear the content of all controls. 16. In the Click event of the Exit menu item, end the application. Click event of AddToolStripMenuItem as well. and BrandName properties. See Assignment 9 for help. 19. Set GroceryItemForm as the startup form. and password to access the main form. files to your desktop or any other temporary location. 2. Click on Take Exam next to the lesson you’re working on. a. Click on the Browse box. b. Locate the file you wish to attach. c. Double-click on the file. steps a–d for each file. 4. Enter your e-mail address in the box provided. 6. Click on Submit Files. as described in the study guide.